【動物, 動物学】 ヤマアラシ 《旧大陸産; 地上にすむ》; アメリカヤマアラシ 《アメリカ大陸産; 樹上にすむ》. Middle English porke despyne, from Old French porc-espin, from Latin porcus (“pig”) + spinus (“spine”), hence also spine pig. Cognate with Spanish puercoespín, Italian porcospino. Any of several rodents of either of the taxonomic families Hystricidae (Old World porcupines) or Erethizontidae (New World porcupines), both from the infraorder Hystricognathi, noted for their sharp spines or quills, which are raised when the animal is attacked or surprised. I have no evidence of grizzlies killing porcupines or vice versa. However, occasionally there is contact and sometimes a grizzly is injured or a porcupine killed, but the latter is rare. In particular, porcupines, hyenas, and leopards are known in Africa to transport bones to particular places. 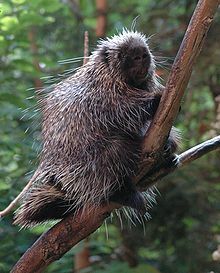 Old World porcupines (Hystricidae) have quills embedded in clusters, whereas in New World porcupines (Erethizontidae) single quills are interspersed with bristles, underfur, and hair. No porcupine can throw its quills, but they detach easily and will remain embedded in an attacker.